Gender terms have become less binary in recent years, with some people choosing to us the singular “they,” for example, to describe themselves instead of “he” or “she.” So maybe it’s not that surprising that this culture shift has made its way to a traditional bakery item. The Independent reports that “the owners of JL Bean bakery in Cleveleys, Lancashire, modified the name on their biscuits last year on a ‘whim,’ according to bakery owner Paul Lewis,” from gingerbread men to gingerbread persons. 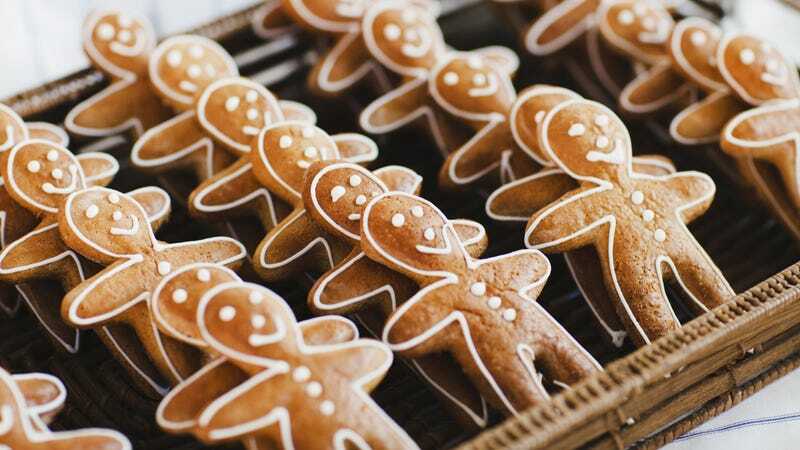 A customer recently went in to buy some of the cookie people, and was corrected when she termed the treat a “gingerbread man.” Her husband than ranted on social media, “Seemingly now you have to call gingerbread men ‘gingerbread persons’ when ordering. As far as I can see there is no law in place for this type of PC nonsense.” We’re trying hard, but just can’t imagine getting this wound up over a cookie title. But Lewis insists that the bakery isn’t attempting to make a huge political statement or anything: “My wife just put this little ‘gingerbread persons’ label on them as a whim, and that was last year,” expressing surprise “at how seriously some of the people were taking things.” His wife Charmaine points out that they’re the exact same cookies, just with a different name: “It is not as if we have added or taken away any little bits.” While some people may be protesting the genderless name on social media, it seems likely that this bakery, founded in 1933, will survive. No word on how this cookie title change may affect the character in the Shrek franchise.